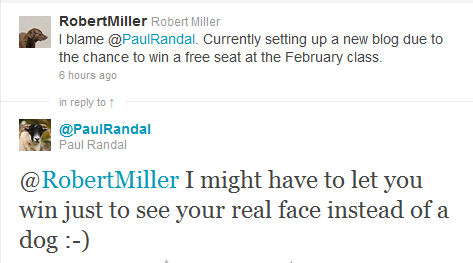 Actually, I have to thank Paul Randal for the incentive to start this blog. Keeping it moving forward will be my responsibility. When I first read about a competition for a free seat to the SQLskills 5-day Internals and Performance class in Dallas, February 21-25 I felt this would be something worth entering and entering means setting up a blog. I had avoided setting up a blog as I felt (and still do) the rest of the community members cover areas I am or would be interested in. Frankly, this should not stop me from writing about various topics from a different perspective and this is what I need to do. I have been programming or working with databases, professionally, in some form or another for the past thirty years. I started on DEC-20s and VAX/VMS systems and learned how to enhance the performance of the large Distribution Logistics Management product, (developed by the company I worked for), by calling VMS/RMS directly with many of the “Go faster” options set. Then VMS/Rdb was released and we had a chance to use it, but the transition from a file-based environment to a relational database was a very steep cliff for us and we backed away. A little while later, we were implementing a new product on Microsoft’s NT Server and decided to make use of the new relational database tool Microsoft was starting to ship. I had a blast learning about it and started to really change my perspective from file-based operations to set-based operations while trying to provide a performant environment. There were no SQL Server rock-stars at that time and the online social communities we have today were not available; in many ways, I was pretty much on my own. Much has changed since then. The SQL Server product I first started using has developed into a robust and multi-faceted tool which I very much enjoy working with on a daily basis and learning all I can about the many ways to utilize its capabilities. Each company I have worked at has given me the opportunity to learn some different aspect of SQL Server. Looking back at the work and perceptions I had ten years ago leaves me wondering just how I have managed to learn what I have learned to this point. As sn example, I thought UniqueIdentifiers were really great ten years ago and I really wish I knew then what I figured out a couple of years after that. My current job has given me the ability to stretch myself in ways I never thought would be available. Everyday brings a new learning experience and a reason to crack open the blogs of many, many members of the SQL Server community along with the books I have and frequent Bing and Google searches. I love this community and I definitely learn from it. I work with a merry band of intelligent pranksters and we are generally faced with one daunting timeline or another and need to get things done now. This means there is not much time for me to research all available solution options and my decisions are generally based on what I know to be correct or a best guess; I hate best guesses and would rather know. On top of this, scalability is a constant theme and all of our work needs to account for this. A little change-up, but please let me explain. I feel my friend Samson J Loo (twitter | blog) deserves to win this contest more than I do; seriously. He is involved in the SQL Server community more than I am, one of the organizers of SQL Saturday Phx, and hitting his certification tests before I will; along with having a family. For many people this might not seem like much, but to me, it shows a level of dedication that I admire. Notice, the section header mentions nothing regarding my desire to win this contest. I would absolutely love to win this contest as it would benefit me in my current day-to-day activities and I expect it would close some gaps in my understanding of core fundamentals. Over the past three years, I have dealt with lots of challenges which left me scratching my head while trying to figure out what to do next to resolve some issue. I have found what I need in my books, (Has anyone really noticed how many members of our community have published books? ), blogs, and online searches. I have browser bookmark folders dedicated to content published by several of the community’s bloggers so I can return to specific topics and gleam another nugget of understanding or as study material. Each day I learn something new and I never feel I know enough. The Microsoft SQL and Windows certifications I earned many years ago have long-since expired and blown away. Earlier this year, I have decided it is time to redo my SQL Server certifications towards MCM certification; essentially starting the certification process anew. The SQL Server community is very helpful in this endeavor and the various reading-lists generated by community members are wonderful. I have also decided to step out of my self-imposed heads-down focus and increase my involvement in the SQL Server community. First up will be a presentation at SQL Saturday Phx (something I teasingly blame Samson and Chris Coneybeer (twitter | blog) for). After that, I would like to give a couple of presentations to the Phoenix SQL Server User Group. I also need to find more time to participate in #sqlhelp and on various forums. In closing, I would really enjoy going to the 5-day Internals and Performance class, but I also believe Samson deserves to go more than I do.